Have you taken the time to find the gravesite of each of your ancestors? 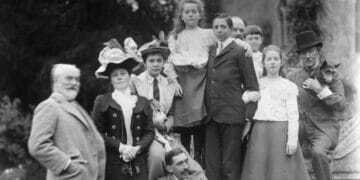 If you haven’t, you could be missing a key part of your genealogy puzzle. 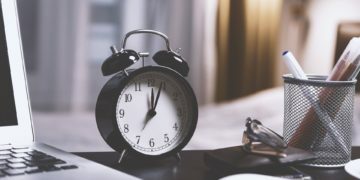 Although we may spend years trying to find records that were created throughout our ancestors’ lives, it is sometimes the information about their deaths that can be the most revealing. This can be especially true when searching for your ancestors’ burial sites because the journey of discovery can turn up some very interesting details. Luckily, there are many resources available to help you discover how your ancestor died, where they were buried and to locate their headstone and related records. In the following article we cover how to find a grave’s location using various records and how to search cemeteries online. 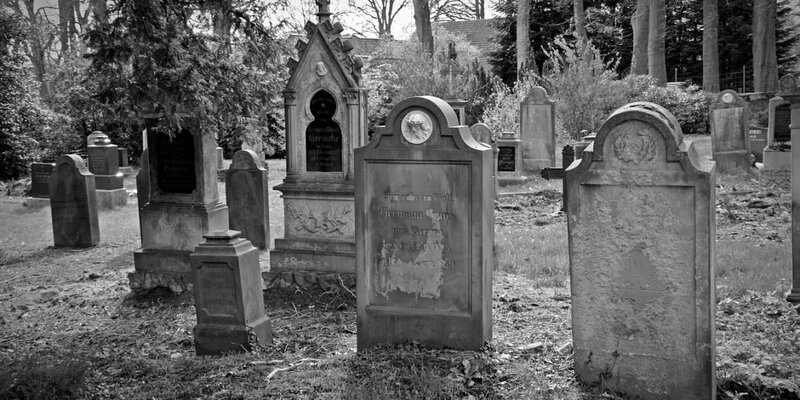 Online cemetery search sites are the place to start if you already know where your ancestor was buried. If you do not, you may have a hard time determining which entry matches your ancestor due to the limited information sometimes available. Take some time to try and find out where your ancestor was buried before digging through these records. If you need help finding this information please read the sections near the end of this article on using death certificates and newspapers for this purpose. Cemetery search engines have been around almost since the beginning of the internet, so they now have an incredible collection of information. 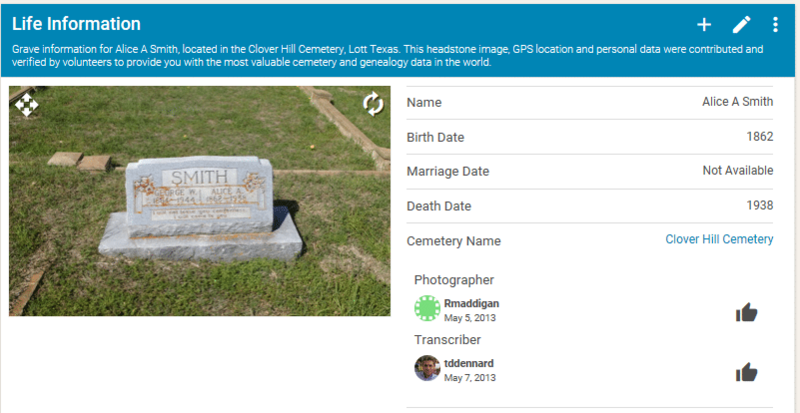 Find a Grave and Billion Graves are two great places to begin because they both contain user contributed (or crowdsourced) data and both sites now have hundreds of millions of records. But there are other options as well. Let’s take a look first at the most popular sites. The most well-known free site with records from cemeteries around the world is Find a Grave – also known simply as findagrave. It began in 1995 and now has over 170 million memorials. Enter the first name (if known) and the last name of your ancestor. The last name is required. Enter any additional information, if known, such as year of birth and the place your ancestor may be buried. If you don’t know this information, simply leave the field blank. For the example below, the death date entered was before 1940 by using the “down arrow” and selecting “Before”. The place of death is Texas. Now press enter, or click the search button, and a list of the results will be displayed. 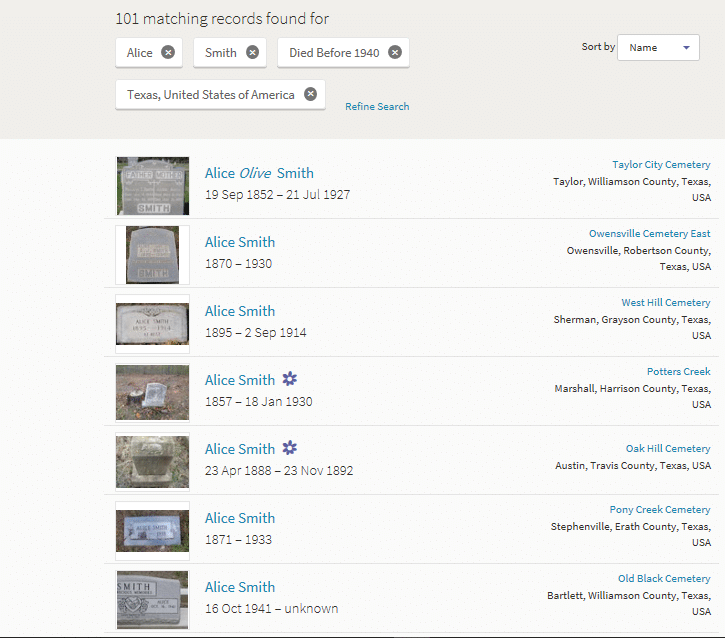 In this instance, FindaGrave had 101 matching records for Alice Smith who died in Texas before 1940. Scroll through the results to search for your ancestor and click on their name to display their information. 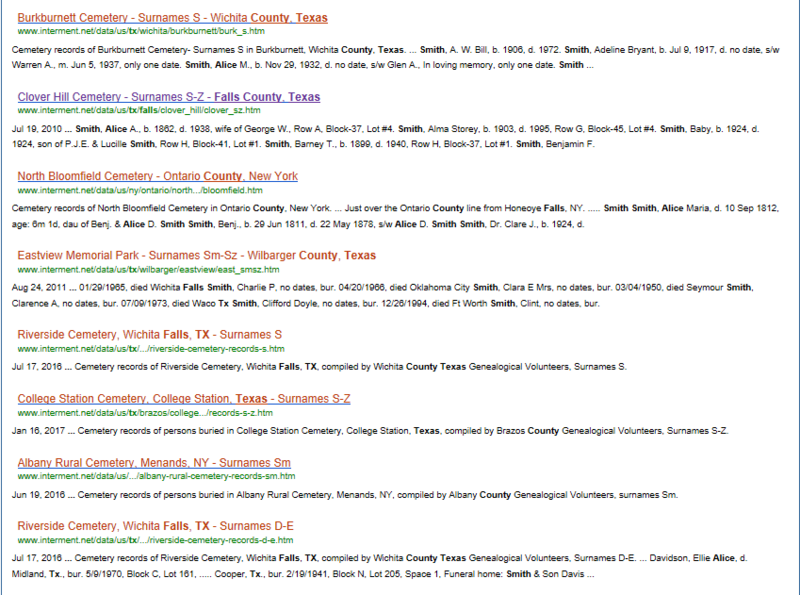 Or, use the “Refine Search” link, at the top of the page, to narrow your results. 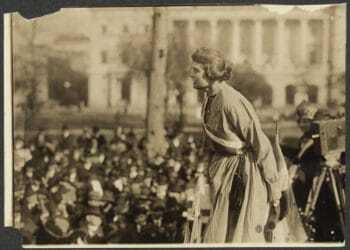 The “Alice Smith” used for our example was Alice A. McLain Smith. Her cemetery information is shown below. 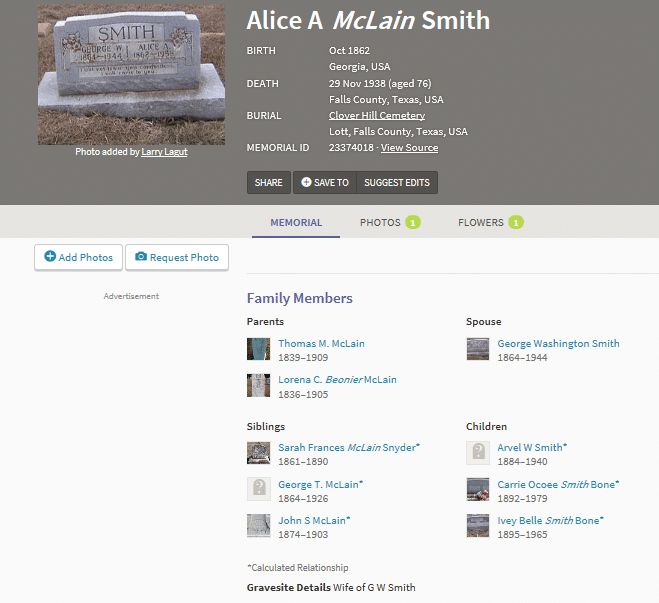 The information for Alice McLain Smith not only gives her burial location but also gives a wealth of information about her as well as her direct and extended family. The other family members are shown as “Calculated Relationships” based on birth and death dates. Not all memorials have photos of tombstones. 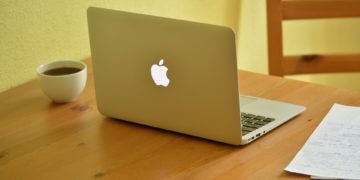 However, you can request a photo by clicking the “request photo” button. 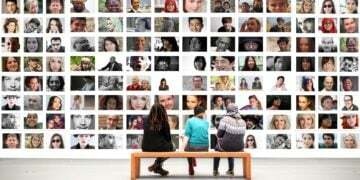 You will need to sign-in, or sign-up, before the photo request can be made. Note: The information generated by Find a Grave varies based on the information provided by contributors. The cemetery information is not always displayed. Some memorials are created by contributors even though the burial information for an ancestor is still unknown. Find a Grave’s website states that “thousands of contributors submit new listings, updates, corrections, photographs and virtual flowers every hour.” So, always verify any information you may find. If you find incorrect information regarding your ancestor you can suggest edits by using the “Suggest Edits” button. Billion Graves, according to their website, “is the world′s largest resource for searchable GPS cemetery data.” The information found on their website is generated by users, with the Billion Graves app, who create GPS data for burial locations. The data is uploaded to the Billion Graves website where those accessing the site can attempt to locate the specific location of their ancestor’s resting place. Enter the first name (if known) and the last name of your ancestor as well as any other information you may already know. The information for Alice Smith at Billion Graves is not as informative as what was found at Find a Grave, but the site does say that more information is available for a yearly fee. Another cemetery search engine, which is not based on user-contributed data, is Interment.net. 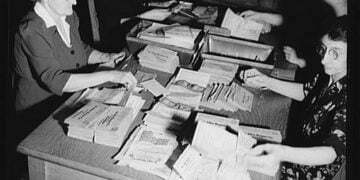 It is, according to their website, “an online archive of transcriptions that spans tens of thousands of cemeteries across the world.” Their data is sourced from government entities, churches and genealogy and historical groups. Enter the name of your ancestor. You may also use the last known location of the deceased to help narrow your search. 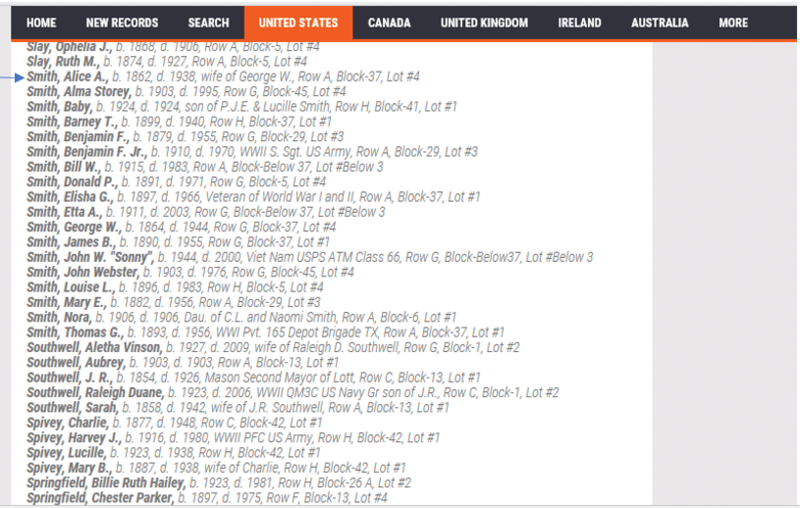 A list of records containing Alice Smith as well as, Falls, County, and Texas is displayed. Click on the details that appear to have your ancestors information (if any). The following information was displayed for Alice Smith, showing the specific location of her burial, along with other Smith family members buried in the same cemetery. Besides cemetery search engines, there are other records available online that can help you find a gravesite – if you have an idea of where your ancestor may have been buried. These can be found through a Google search. Enter the first and last name of your ancestor, the city or county you think they may be buried in, and the word, “cemetery” and click search. 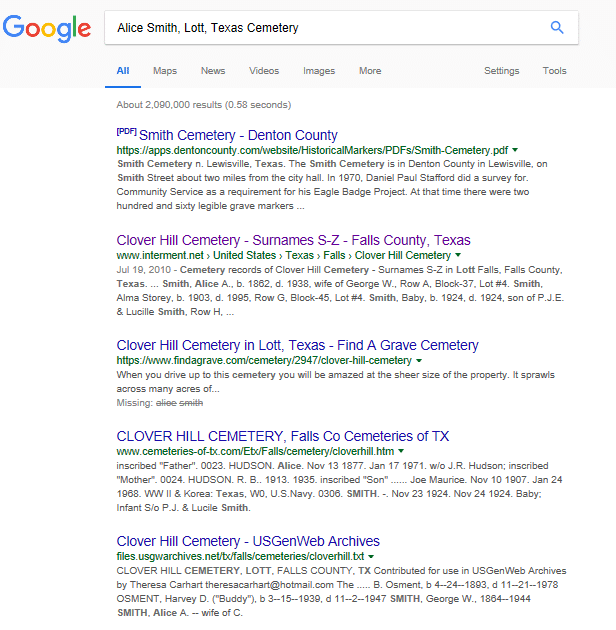 In this example, the last result on Google, for USGW Archives, is another cemetery listing showing the burial place for Alice Smith. 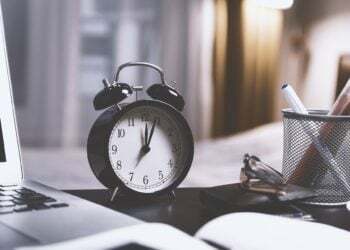 Note: You will likely need to get creative to find the information you need so we suggest reading this article about maximizing your Google search to help. Some death certificates can be accessed for free at FamilySearch.org, while others can be obtained through the county clerk’s office. Be aware that death certificates are generated in the state where a death occurred. Also, while some states began creating death certificates by 1900, they weren’t widely mandated until the 1930’s. Below is the death certificate for Alice Ann Smith found at FamilySearch.org. 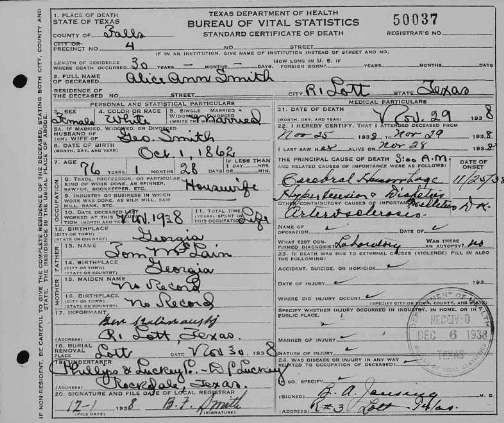 This death certificate does not specifically list the cemetery where Alice Smith was buried but does show the town, of Lott, [Texas] where the burial took place. Newspaper obituaries can be excellent resources for burial locations. 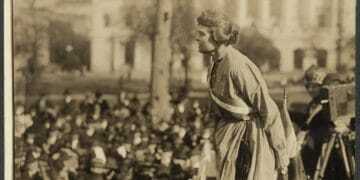 One of the best free sources for newspapers is Chronicling America, from the Library of Congress, which has digitized newspapers from 1789 to 1963. 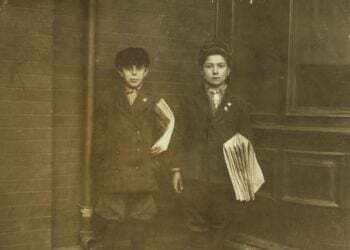 Google also has an extensive, free newspaper archive, which we covered briefly in our quick guide to finding free newspaper collections. The top subscription-based websites for newspaper obituaries include Genealogy Bank and Newspapers.com. Social Security Death Records – For deaths after 1935. Access for free at FamilySearch.org. U.S. Census Mortality Schedules – For deaths 1850-1880. Read more about this important resource here. U.S. Veterans’ Gravesites Records 1775-2006 – If your ancestor was a veteran. Paid subscription through Ancestry.com. 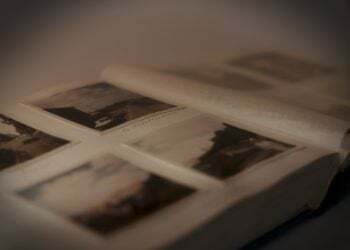 Once you know where a death possibly occurred, you can contact mortuary or funeral homes and/or local churches your ancestor might have attended to inquire about their death records. Oftentimes, people at churches and funeral homes can be the best source of information. For ancestors who died between 1700–1900, their local mercantile store may have provided the funeral arrangements. Many current day funeral homes that have been in existence for over one hundred years, started out in a mercantile store offering caskets and other funeral-related accessories. 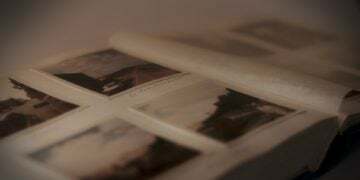 Many of those records are no longer available, but some funeral homes may still have records from over a century ago that were transferred to a local museum or other archival facilities. No matter where you end up finding information regarding your ancestor’s resting place, keep in mind that if the burial occurred more than a century ago, finding the actual cemetery and/or gravesite may be harder than you think. Unfortunately, while some burial records have been preserved well over the centuries, some actual burial grounds have not. Some cemeteries, especially those in larger cities, may have been moved to other locations so it’s important to do thorough research prior to attempting to visit your ancestor’s grave. If you’re certain that the physical gravesite still exists, plan your trip accordingly. Use a good mapping software to ensure you make it to your destination and follow the rules and regulations of the cemetery. Depending on the time of year and location of the cemetery, watch out for snakes and insects – and, of course, be respectful of others who may be visiting the cemetery. 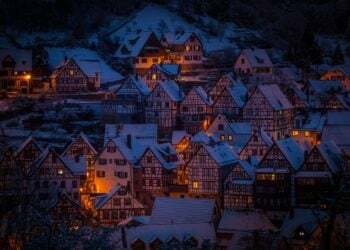 The journey to find the final resting place of your ancestor can leave you with a deeper bond to those who came before you and provide many more connections on your family tree. If you have utilized all the available resources to find a family member’s gravesite and have not been successful, don’t give up. In genealogy, many records are still just waiting to be discovered. 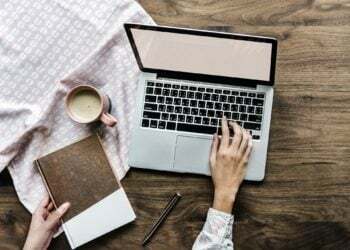 Donna Streetenberger is a professional genealogist and freelance writer. She has enjoyed helping people find their elusive ancestors for over twenty years. With a background in technical writing, she enjoys old world genealogy research coupled with new technology. She has published numerous articles, online and in print, about genealogy research and history. Find her at www.ResearchingAncestry.com. I didn’t see the US GenWeb state sites listed. Those are full of cemetery information, not all shared with the usual sites you mentioned. Very important caution!! The dates on the stone are not always correct. Both of my grandmothers have the wrong dates on them. The information carved there is only as good as the person supplying it. You are absolutely correct!! It doesn’t make any difference if it is an old stone or a new one, dates can be incorrect. The same goes for Death Certificates. They’re only as good as the person giving the information.